EFT, or Emotional Freedom Techniques, is a powerful energy healing modality. Its founder, Gary Craig, states that the cause of all negative emotions is a disruption in the body’s energy system. By tuning into said negative emotion, and applying gentle tapping to key meridian points on the body and face, the disruption eventually disappears. Once the impact of memories and incidents that trigger physical or emotional distress is reduced, the body is then free to rebalance itself, and return to a state of health. Since at least 90%* of all modern conditions are due to an accumulation of some negative emotion or another, EFT can jump start healing for countless emotional of physical issues. The emotional circuitry is very similar from one human being to another. It turns out that we all experience emotions on a physiological level, whether we are conscious of it or not. A specific emotion will send to the brain a message aiming at the production of a specific set of molecules, with each a different role in the body. For instance, anger has an influence on heart rate, skin temperature and the flow of energy through the body. Every time we remember something that has any emotional charge, our body goes through very measurable and reproducible changes on the physical level. And if there are plenty of distressing memories in any given area of experience or one big emotional shock, then the physiological repercussions increase in number and importance and so do the electric disruptions in the system. The tapping targets specific points on the body and face that are located along energy meridians. Those have been identified and studied by Chinese medicine practitioners for thousands of years, and more recently, by western research scientists as well. Meridians conduct electricity – and information – much faster than surrounding tissues and by tapping on specific end points close to the surface of the skin, a piezoelectric current is generated and sent along the meridian restoring electrical balance on the way. The disruptions are eliminated and the corresponding negative emotions disappear as well. Even though EFT doesn’t treat or address any disease or physical condition directly, it’s been successful at eliminating the energetic imbalances and alleviating the corresponding emotional baggage underlying many conditions. The domino effect then allows the body to resolve the actual disease or physiological issue. Not only is it generally a good idea to try EFT on everything, including any health issues, psychological problems, and performance issues, but EFT has been known to work where other methods have failed. For a map of the tapping points, click here. Depending on which version of the EFT manual and/or which practitioner you are tapping with, there are lots of different points involved. The original recipe included 14 tapping points, one for each of the meridians and channels of the body. The Sore Spot is not located on any meridian. It corresponds to lymph nodes on the chest. When lymph nodes are engorged, massaging them will feel sore and will allow the excess lymph to be circulated again. This spot is useful in fighting deeply seated psychological reversal and self-sabotage. The Top of the head is now used by most EFT practitioners because it is located at the meeting point of several meridians at once, hence its name of “Hundred Meeting Point” in Traditional Chinese Medicine. The line at the base of the inside of the wrist is home to three meridians: heart, pericardium and lungs meridians. It’s useful to include it in the tapping round when the finger points are skipped. Before you start tapping, give a rating to the issue you want to address. EFT practitioners use the SUDS scale (or Subjective Units of Distress) in order to gauge the intensity of the problem and you are encouraged to do the same. On the SUDS scale, zero corresponds to a complete absence of distress and 10 to the most intense distress you can imagine. Write your number down. After a round of tapping reassess your number: has it gone down (improvement), gone up (it feels worse), stayed the same (it’s not working) or changed (it’s a different aspect of the same issue that is now bothering you)? If your rating has decreased, increased or the issue has shifted, then EFT is working. Another way of knowing if EFT is working is by noticing your body’s natural relaxation response: do you feel more relaxed, how about the tension you always seem to be carrying in your shoulders or chest, are you sighing or yawning, or maybe you feel lighter? Beware, sometimes EFT works so well and so quickly that some of you will be tempted to attribute the cause of your improvement to anything but EFT. That’s the well-known Apex Problem. If it’s not working, and nothing changes after a round of tapping or two, read the answer to the next FAQ. Are you completing the sequence right? If yes, then try it again, this time instead of tapping on the karate chop spot, rub the sore spot, which is more effective in removing potential blocks to healing. You could be focusing on a problem that is too global. EFT works better if you break down the issue that you want to work on into several single-event chunks that can be tapped on separately. If you can’t break your issue down and if you can’t identify a core issue, then you might be the victim of a toxin in your system. For more on toxins, click here. And of course, if it still doesn’t work, consult a professional. EFT is simple to learn, but it takes a lifetime to perfect it and an experienced practitioner with a fresh eye on your problem will be able to guide you on your healing journey. Are there any limitations to what EFT can do? Like any other stress-reduction method, EFT is not perfect. It is not a panacea, and it does not have a 100% success rate. But it usually works reliably, as evidenced by research studies. Even though EFT can sometimes achieve spectacular results, this is not true for everyone. Some issues require a lot of persistent tapping, some others – like very intense emotional or physical pain – shouldn’t be tackled on one’s own. If you have emotional or physical problems it is essential that you consult your physician or licensed mental health practitioner, since EFT is not a substitute for medical or mental health treatment. Please share your experiences with EFT with your healthcare providers. 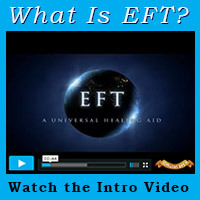 EFT is one of the gentlest modality available today. Professional EFT practitioners commonly master several techniques destined to keep their clients from re-experiencing physical or emotional pain when tuning into painful memories. That said, it is not uncommon to have some clients shed a few tears that subside with further tapping. Most people report feeling better after a tapping session. But it is also possible to feel tired and/or in a fog, which is the sign that the body needs rest in order to integrate the changes on a cellular level. In any case, I always advise my new clients to get plenty of rest, drink plenty of water and be gentle with themselves after every session. It is very rare to have clients feel worse after a tapping session than before. That often stems, not from the tapping process itself, but from the fact that an unaddressed issue that was originally masked or repressed is coming to the surface. In this case, more EFT is recommended to take care of the new negative feeling. Why are EFT statements negative? EFT starts by acknowledging what is there. That includes every negative feeling, or limiting belief the patient has set to work on. And before these negative aspects are out of the way, the client’s subconscious mind will most likely resist the use of positive statements (imagine someone who wants to be wealthier and uses affirmations like “I’m a money magnet.” Or “money comes to me easily and frequently.” In this case the subconscious mind is the little voice that could say “Yeah, right!” with a sarcastic tone). If when working with affirmations, you experience a resistance or any form of physical or emotional discomfort, then the frequency on which you are vibrating is that of the resistance or discomfort, not that of the positive statement. If you remove the former through gentle tapping, then you are making room for the latter and for more positivity in your life. Besides, EFT is not limited to negative statements. It can be used with positive phrases as well. Once the negative charge is greatly diminished, I like using several techniques – including Pat Carrington’s Choice Method or Sasha Allenby’s Field Clearing Technique – to either bring about or anchor positive change. Are EFT’s results due to either the placebo effect or distraction? For the placebo effect to work, the patient needs to believe that the treatment he or she’s been given will work, whereas EFT works whether the patient believes in it or not. There’s even been a double blind experiment done by Dr. Roger Callahan, the grandfather of EFT, during which both the “tapper” and the “tappee,” both scientifically minded and extremely skeptical, didn’t believe that EFT could bring on any positive and lasting result. And EFT did work! EFT is not distraction therapy either. Patients are instructed to tune into their problem and repeat reminder phrases at each point that’s being tapped. If someone asked you not to think of a pink elephant, you would instantly imagine a pink elephant. Likewise, it is impossible for the brain not to think of what the mouth is repeating during one round of tapping. Besides, if your mind still managed to wander away from the tapping process, you would notice that EFT doesn’t work as well. If after a round of tapping you can’t tune into the initial negative emotion that you were tapping on, it is not because you were distracted, but because the electrical imbalance in your energy system has been successfully rectified.